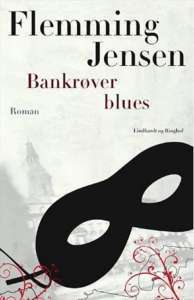 The bank robber blues is a crime novel definitely out of the ordinary: the main character Max kills the Danish prime minister. In very few pages we know both the killer and the victim, and that’s enough to overthrow our idea of the classic crime novel. Basically, the plot goes on with the killer that needs in turn to create a mystery, finding a fake but credible culprit. At this point Signe, a young and very curious scout, arrives and her entry forces the killer to explain every detail of the murder in a convincing way, in order to prevent her from going to the police. Initially the story works out pretty well, and we are amazed by the harmony of the plot narrated with a spotless and rather explicit technique: the narrator knows he is telling a story, he cuts and sews his story informing us every time about the interventions he is about to make. This narrator, who immediately introduces himself as a friend of Max’s, is well aware of his role as a mediator between the storyline and the plot. He even seems to know Génette’s structuralist theories when he uses all the functions identified by the French narratologist: the narrator in fact, in a metadiscourse, explains how he will organize his story (directive function), he explicitly attracts the readers’ attention directly appealing to them or ‘chatting’ with them without adding relevant information (communication function), he describes his opinions on the story (testimonial function), he anticipates what and how he will tell about in every chapter (metadiegetic and metanarrative functions), and he orientates the reader’s attitude in mentally elaborating his story, inviting him to share a certain judgement (ideological function). These functions are obviously present in every narrative work, but here we find them meticulously and accurately balanced, as if Jensen had set the goal of having them all in equal proportions. To give us an idea of how the author is aware of being an author, looking at the titles of the three sections of the book is enough:“Prologue”, “Characters Descriptions” and “Climax”, and before the prologue we even see a microsection titled “Narrator’s Identity”. These are all explicit metanarrative statements that occur all the time, almost brutally: moreover, they contain an equally explicit admission of the exegetic interference in the development of the events. This is due to the second degree of the narrative: the narrator knows that the way he will present the facts is necessarily affected by his judgement, and warns the reader about it. There is no pretense of objectivity. Adding to that, there’s a clear perception of the belonging to a literary genre, it is openly said to be within the spectrum of a “crime novel”: the traditionally extra-textual attributes, such as the genre, enter here the text, and even the narrator communicates not only an awareness of “story”, but even of “book” in its materiality; he talks about pages “browsed” by the reader. An example of this may be a seemingly trivial passage that contains in itself far more than just one interesting thing: «So far so good… but, for God sake that idiot had decided to come that very week?! Yes, I’m using Max words, because this thing really unnerved him». Here the free indirect speech is used and it is assumed that the readers recognize it immediately as such, that they consider who can be the author of the thought, that they formulate their hypothesis eventually confirmed by the narrator through the warning that they were right. All these little details show us a virtuosity of narrative technique, and actually represent the only really positive aspect of the novel. The narrator wants to play with the reader and knows perfectly how to do so. There are even corrections and afterthoughts that show an attention to the style too. The book belongs to the great genre of the Humor noir, which has amazing literary examples. This literary genre, which Swift brought to superlative levels with his A modest proposal, is characterized by a totally ironic narrative, in which we assume a clearly non-accepted (nor acceptable) point of view, in order to uncover the inconsistencies of what is socially accepted, instead. To say this using Francesco Orlando’s Freudian categories, it does this by creating a ‘compromise-formation’ between the identification (which comes from assuming the given viewpoint) and the non-identification (which makes us clash exactly with the given viewpoint, opposite to what we are normally accustomed to think). In the Great Literature (or in the great satire, which has the same internal mechanism) this constant game between what is accepted and what is unaccepted makes us face our thoughts, disintegrating and reassembling them: it is a distorted view, a continuous ironic shift that, with laughter (Freudian aggressive mechanism), reveals social hypocrisy, representing then a sharp critique. In the Great Literature, I said. Not that of Flemming Jensen. His compromise-formation does not open our eyes before society, and does not even reveal a free and playful divertissement for its own sake (the one that Stefano Brugnolo identifies for instance in Quentin Tarantino’s films). Jensen is well below this. The reductio ad absurdum of brutal mechanisms which are passively accepted by most of the people is a serious game, and above all it gets a rich meaning when the possibility of a different and better reality is suggested between the lines. Jensen does not master this game, he actually becomes bogged down in it. In my opinion he lacks the moral fiber of a true satirist, and risks to give us only the reactionary vision of the status quo, which is unsatisfactory, as much as the possible alternatives. The game is rigged, then, and it becomes just a literary bluff: behind the mask of the critics, one finds all the political apathy of the message. “If this social evil may only be replaced by a different evil, then it’s worth keeping what we already have” seems to be the underlying thought. In this background, there are also some racist slips against Islam (which seem to be really trendy lately). The rhetoric of the poor war hero is also present, it conveys the idea that wars are bad, dirty and evil, without neither originality nor deepening. But let’s face it, it doesn’t take Jensen to figure this out. In addition, to tug at people’s heartstrings, the disgustingly pleonastic topic of marriage is forced onto this military rhetoric: the poor soldier who left home to go to war was about to marry. He had clearly said that he wanted to offer a better future to his future family (by going to war?). This is probably the worst dive in a sea of trash, considering that this is stated by a girl who is around twenty years old. Paradoxically, the same mechanisms that are denounced (such as not to let anything and anyone stop you, careerism, deception as a mean of self-assertion) are here suggested as measure of behavior, and this is the great bluff in here. It is not a distorted view that makes us understand that the socially accepted point is unacceptable (we talked about Swift); it’s rather a distorted view in which what is condemned is what everyone does and this will always be the case. In short, the conservatism pushed to the limits. Initially the reader is driven to an aggressive smile against the power, and then to a smile that relates to some kind of alternative which turns to be equally cruel power. Overall, the novel is really the opposite of a classic crime novel for many reasons: we know everything immediately, the plot is cut to the bone, the social background is not described, and when it is, it is done in a sloppy way – yet the real positive side in the book it is right the raw material and the author’s awareness of the mastery of narration. This is even more significant, given that Flemming Jensen (who was born in 1948 in a small town in the Sjælland region, Denmark, but who lived in Greenland for a long time) is essentially a stage actor who has also worked in Danish television in comic and satirical programs. In fact, if we had to predict an imbalance, we might have expected a more direct and targeted criticism, and perhaps less technical skill.